At an evening during a meeting at the Dagstuhl institute in Oberwolfach, we played a few games with some nicely colored piramids. My favorite was Zendo: a game where one player invents a rule on configurations formed by the piramids, and the other players have to guess the rule. Apparently, many different games can be played with these piramids, called looney piramids. The piramids are sold by a game company called Looney Labs; the company also provides many games that can be played with the equipment. One of the games that can be played with the piramids is called Martian Chess; a strategy game with some chess elements in it. The game is played with two or four players. Two players play the game on a board with eight rows and four columns; four players play the game on a standard eight by eight board. Pieces are actually not owned by a player; instead, a player owns a quadrant (a 4 by 4 part of the board). A move consists of moving a piece that starts in the quadrant of a player. Queens. These move like a queen in standard chess. Drones. These move like a rook but only one or two squares. Pawns. These move one square diagonally. 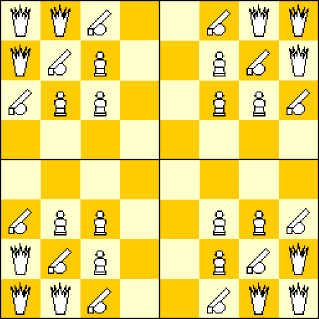 The opening setup for two players is shown below. 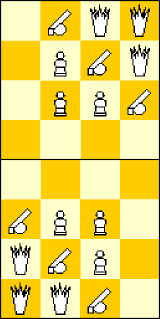 In this diagram, the symbol of a chess queen is used for the queen; the symbol of a cannon for a drone, and the symbol for a pawn for the pawn. When playing with the piramids, one uses the largest piramid for the queen; the middle size piramid for the drone, and the small piramids for the pawns. For four players, the starting setup is as follows. Pieces take like they move. Players win the game by scoring. One scores 3 points when taking a queen, 2 points when taking a drone, and 1 point when taking a pawn. The game ends when one of the quadrants is empty, i.e., when a player moves the last piece out of his quadrant. Note that when you take a piece from the opponent, the piece you take with becomes his (temporal) property, as that piece now is situated in his quadrant. If you have one piece in your quadrant, and you are ahead in points, try to end the game by moving your piece out of your quadrant. Written by Hans Bodlaender. Do not confuse this game with Jetan: another chess variant called Martian Chess. This is a fine leightweight strategical game for fun. Author: Hans L. Bodlaender. Inventor: Andrew Looney.